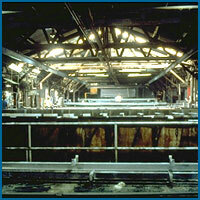 Historical Digest of Aluminum Anodizing - SAF by permission of the AAC SAF – Southern Aluminum Finishing Co, Inc. It was during the 1920’s that aluminum really began to turn the world of metals upside down with its benefits of light weight, strength, fabrication flexibility, and durability. Since then, aluminum finishing technology has provided a steady stream of protection and coloring improvements. First and most important of these was the development of the anodizing process that converts an aluminum surface into an extremely hard, durable, corrosion resistant, long lasting aluminum oxide finish. For today’s anodizer, the process includes specialized lines for: batch, continuous coil, continuous parts, and even baskets for small parts. Specialized processing technology has allowed the industry to remain competitive and at the same time give excellent quality. Recent breakthroughs in aluminum coloring techniques produces color choices that rival paint, but with the technical advantages and beauty of anodizing. Whether you need aluminum coil or batch production, anodizing provides one of the best aluminum finishing options in the industry. See Anodized Aluminum Reference Chart. Protect satellites from the harsh environment of space. Used to build the world’s tallest building – the scaffolding of the Sear Tower in Chicago, Illinois. Have revolutionized the construction of computer hardware, exhibit displays for trade shows, scientific instruments, and a constantly expanding array of home appliances, consumer products, and building materials.